Today I want to share with you my summer lifelines. Well, some of them. 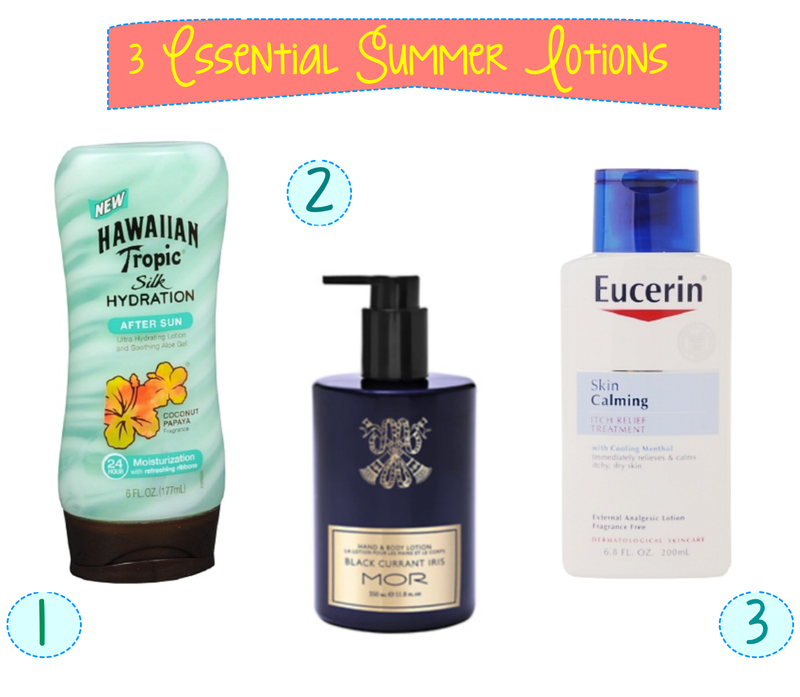 I've never really been a huge lotion fan; my skin is weird and so am I. Lotion has always just bugged me. BUT. This summer it seems like my skin has been ridiculous, and it hates everything I do to it. I've compiled a list of the lotions that I've owed my life to for the past few weeks. Oh, PS - I'm super nosy and love to see what products other people love, so I just wanted to return the favor. You know. And just a note: Sunblock is a MUST for me (#irishgirlproblems), but I did not include any of those in this list. They are pretty much a given, so here are the others I've been using. 2. MOR Hand and Body Lotion - Black Currant Iris is the only one I use. It comes in some other awesome scents, but this is the best. On days when I want to wear a light scent that stays all day -- and hydrate my skin, obviously -- this is my go-to. Sometimes it's just too hot for perfume, and this is a great substitute. 3. Eucerin Skin Calming Itch Relief - I know, I know. This one's a little weird. I'm sorrynotsorry. My skin gets super itchy for whatever reason, and this is the only thing that stops me from scratching to death. In the winter, it gets so bad on my legs that I scratch in my sleep and wake up with what look like animal scratches all the way down my legs. So pretty. Thank goodness it's not that bad during summer, otherwise I'd never wear shorts or dresses. The horror! Anyway, I need this. Mmmkay. Now that you know my secrets (no, really... I don't tell too many people about my weird leg scratches), it's time for me to #backthatazzup with Whitney and then go grandma it up and watch my Jeopardy. This randomly came on the other day and I suddenly remembered how much I love it. But I am in NO WAY a redneck woman. Yeesh. You and I are in the same boat. I use after sun but it's not this brand. It's banana boat or something. Or an off brand I'd have to check later. It's great tho. as for lotion I use avon alot. and bath and body works kind. also Aveeno lotion for itchy skin or whatever works great. Eucerin has to be the best invention ever!! And I love Red Neck Woman one of my favorite songs! !